I have added a waypoint sharing feature to this website. If you click on the link below it will take you to a page that will explain how to upload my waypoints to your compatible devices. 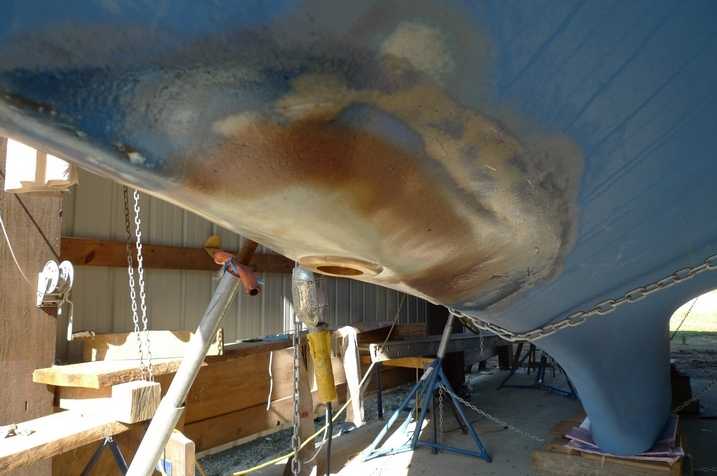 Wow, another year of boatwork. I will finish this year. I have to get on the water and realize what this was all about. Used my jointer as a fingernail clipper and trimmed it a little close. I will attempt to do that now. 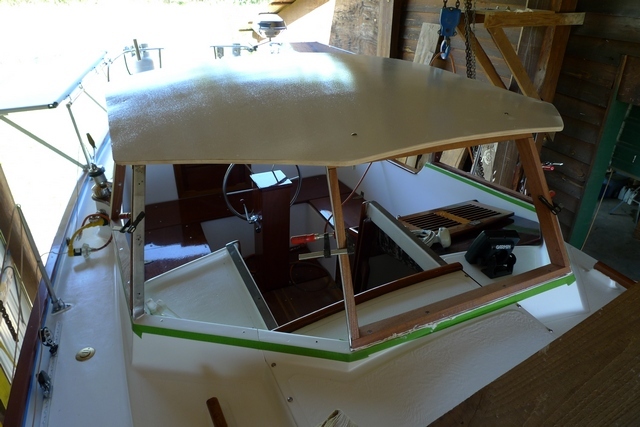 I have been busy finishing interior woodwork, installing the "tiny tot" heater, installing the transducer and ground plate, building the hardtop and rebuilding the mast and redoing the anchor system and engine hatch. 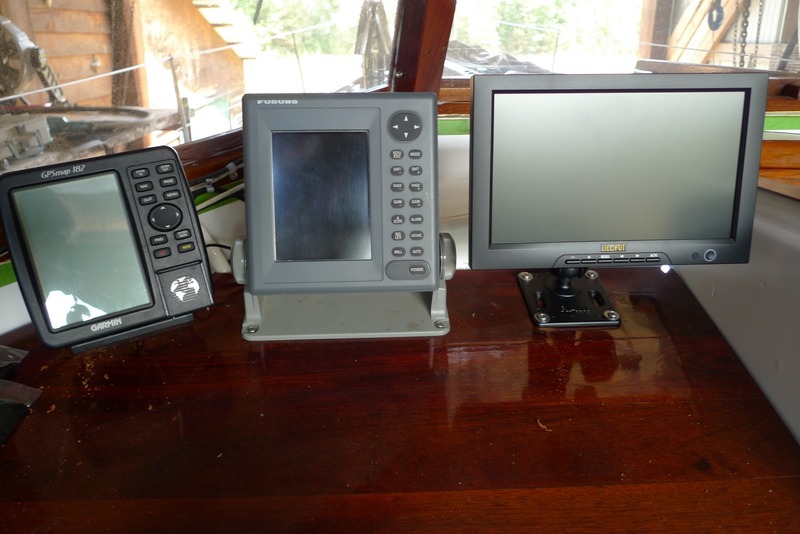 Ground plate and transducer for Furuno fishfinder. 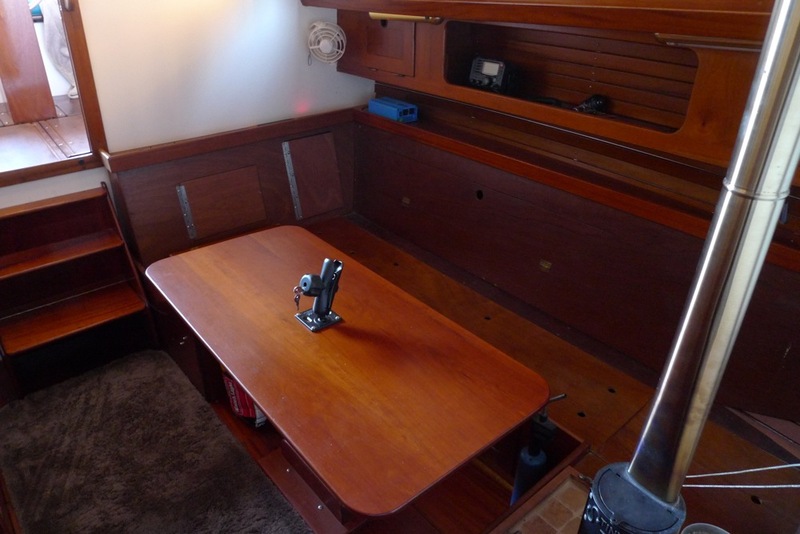 I had alread mounted the fishfinder transducer and had to place the ground plate right next to it. Hope that doesnt cause a problem. 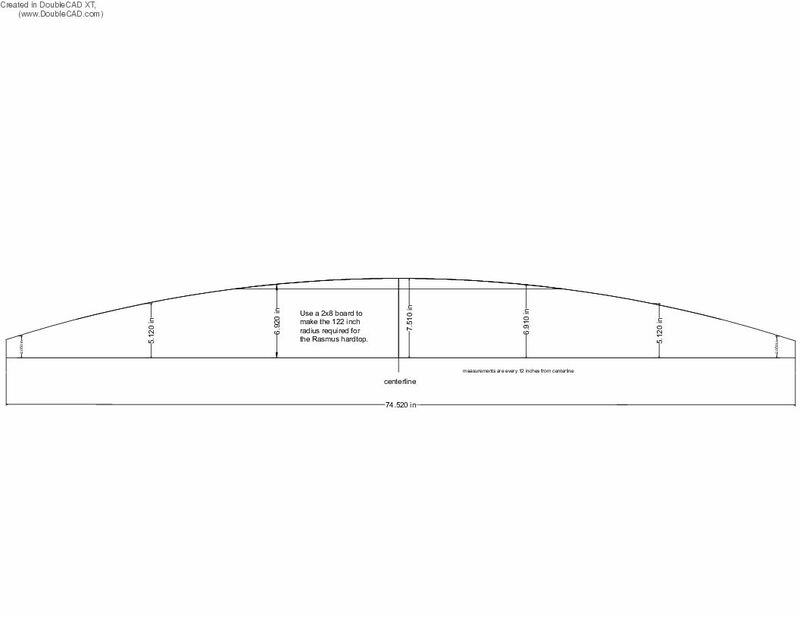 Measurements to make jig for the hardtop at 122 inch radius. 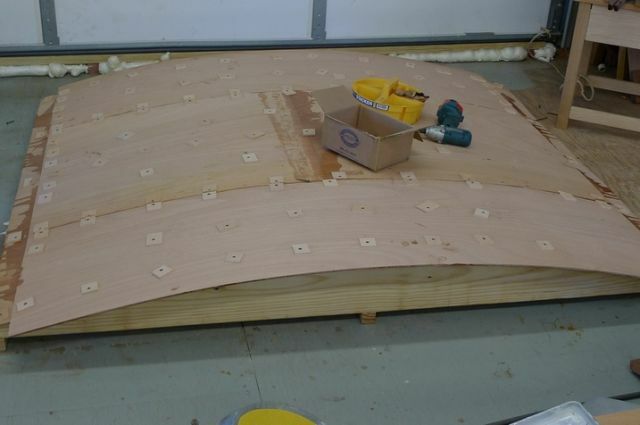 Bonded two 1/4 inch marine ply using epoxy, sheetrock screws, and ply squares to keep from dinging the top. 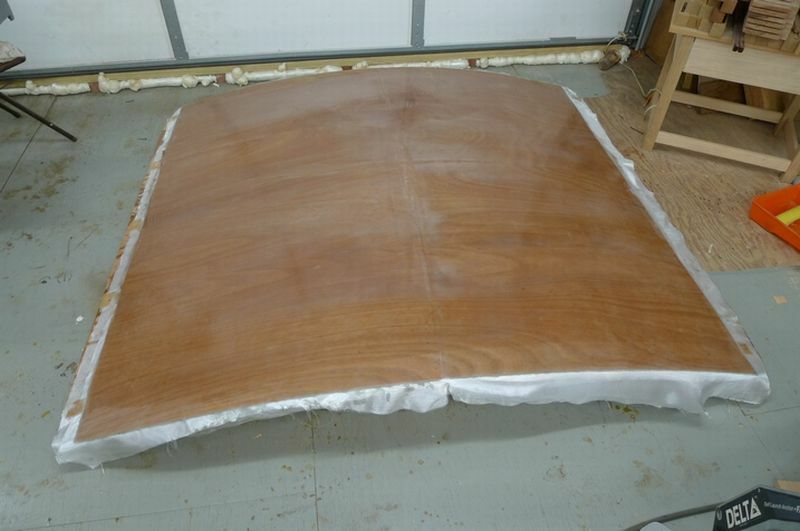 Top glassed with three layers of 9 oz cloth, faired using Quickfair, sanded, and coated with System Three Epoxy. 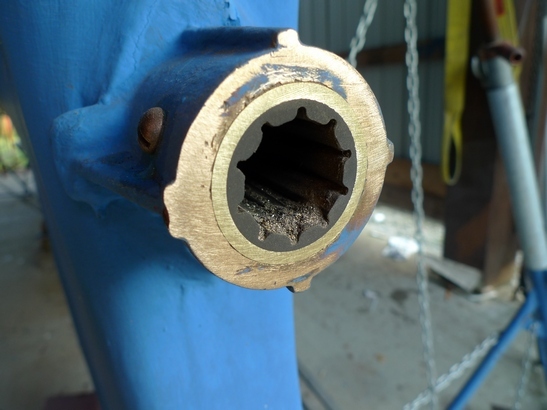 I replaced the old cutlass bearing with a nice new one in the 1 1/8 inch shaft diameter size. The outside diameter of the cutlass bearing is 1 3/4 inch outer diameter, which suprised me considering it was built in the land of metrics. 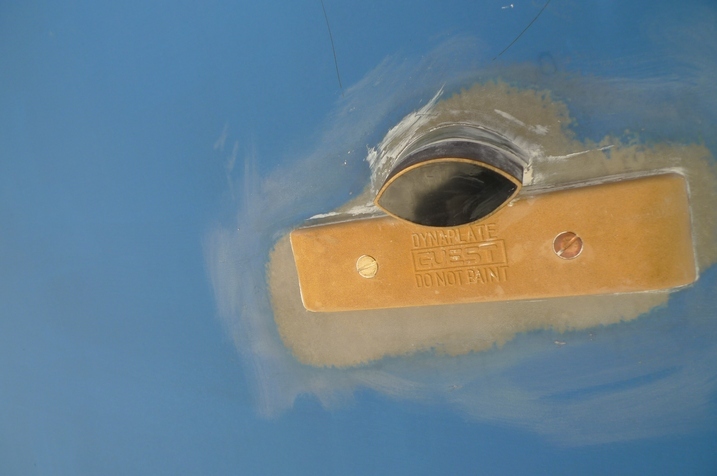 I added an aluminum plate to keep the anchors off the wood and also to hold the fortress anchor in place using two grooves I cut into the aluminum plate. 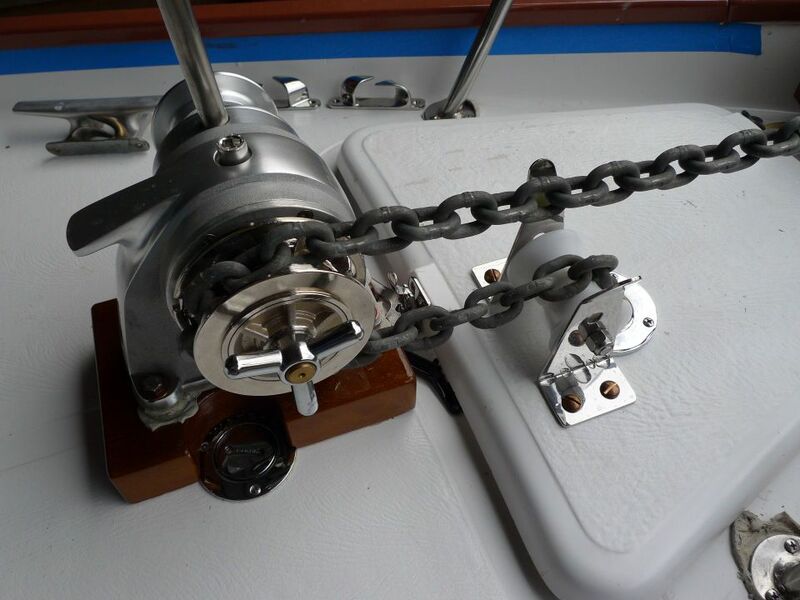 I installed the other anchor chain stop. 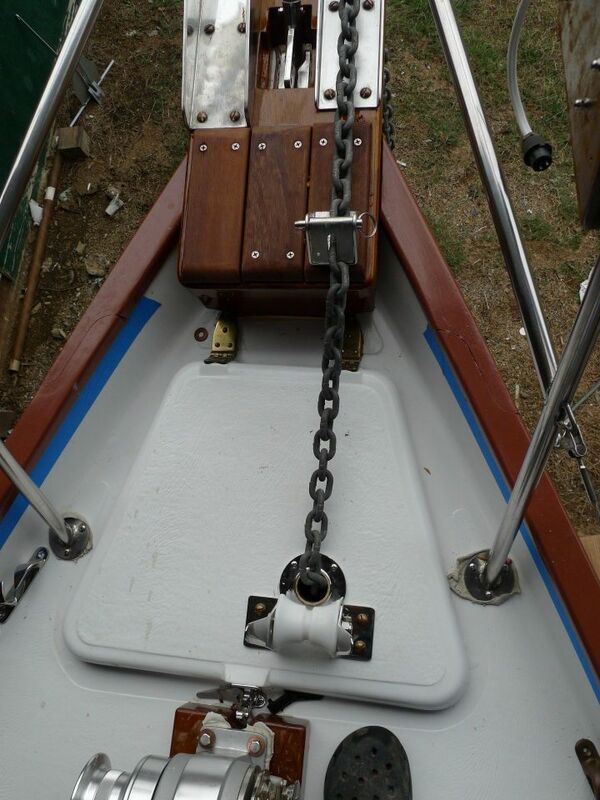 Anchor system is COMPLETE. I finished the hardtop and windows. I trimmed out the exterior windows with teak and a little mulberry. 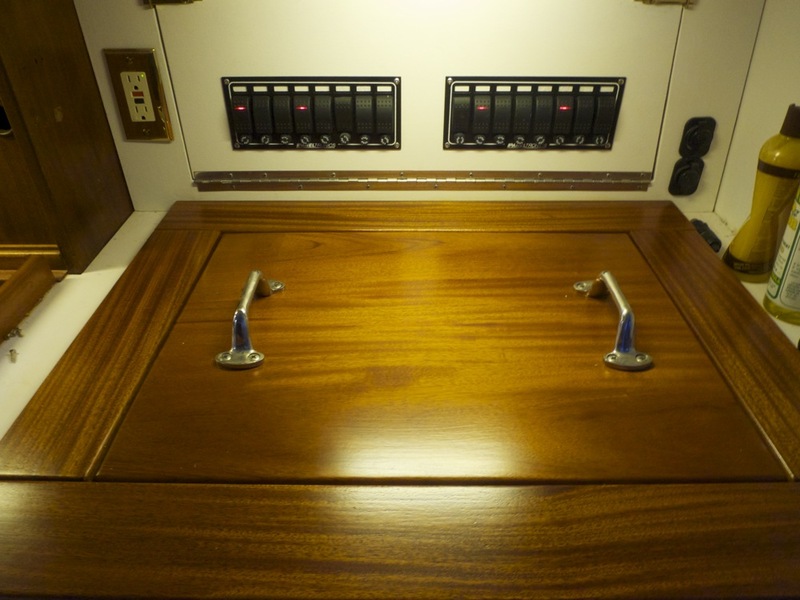 If you don't know, mulberry looks very much like teak. I can't tell the difference and it is almost as rot resistant. It is just very hard to find. I milled these pieces myself from a tree in Little Rock. Tiller handle made from cherry wood. 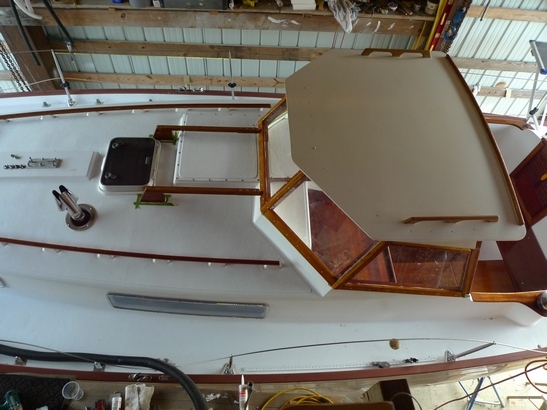 In the last few weeks I have been mounting electronics, getting the engine room ready for the engine, and installing the remainder of the Cape Horn self steer gear. Below are pics and desciptions of the work. I have shimmed each engine mount with 1/2 inch thick plate of aluminum. I am "guessing" from the original equipment that the original engine mounts were thicker than the new ones. So to make the engine fit, I am hoping these shims will do the job. These shims will keep the engine lower on the mounting bolts as the instructions suggest. I installed the Groco raw water strainer over the newly installed sound proofing. Installed new fuel lift tubes. I figure the old ones were at the end of their useful life and this was the best time to change them out. 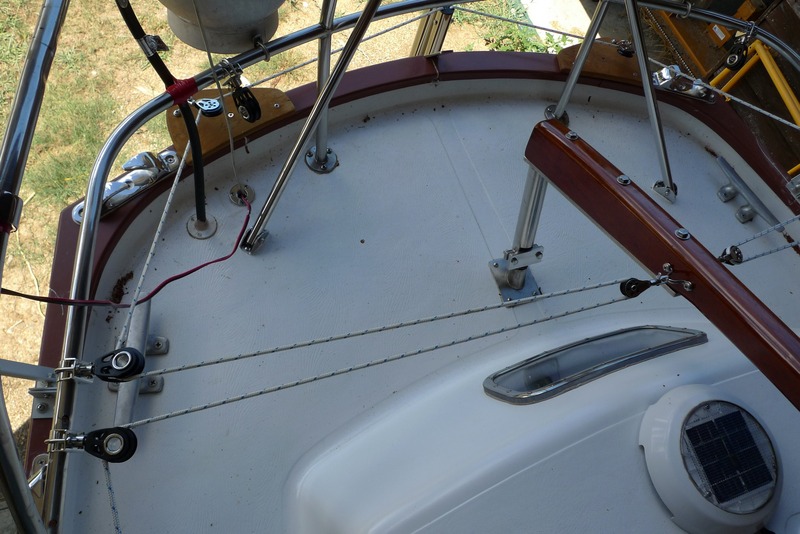 I finished running the rigging for the wind vane self steer gear. I used RAM mounts with VESA mounts to install monitors for my navigation computer. One monitor is on the galley table and another, a Lilliput field monitor, is installed in the cockpit. 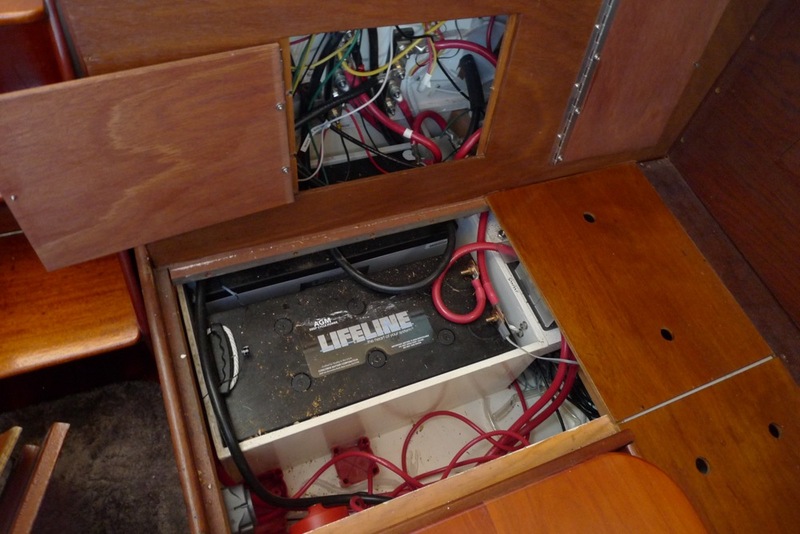 The Lilliput runs on less than 10 volts and can be hooked up directly to 12V system. Every year a pair of house wrens nest in my boat. I have been careful to let them have thier way and raise the chicks safely. But today I had to move the nest which they built in a spot I had to work on. I moved it just 4 feet from its spot. When the couple returned, they gave me a serious talking to and flew away. 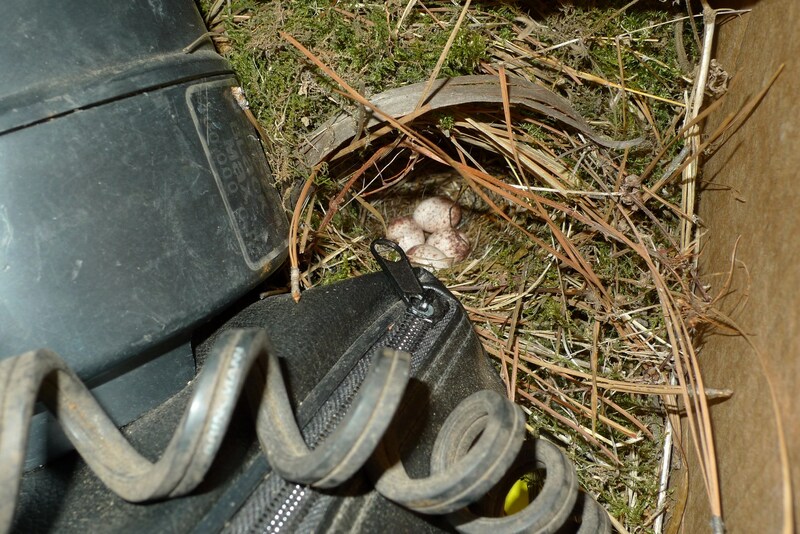 I wondered if they would ever find the new location of the nest and felt bad about it. But within the hour they had located the nest and resumed their diligent lives as parents. Notice the beautiful arching entry way to the nest. I thought about naming the boat "Wren". This boat has been a shelter for about 20 little house wrens. I have built four drawers and two doors out of nice cherry wood I had milled from my neighbors yard. I finished them with Old Masters semi gloss varnish. They have been installed and they fit nice. 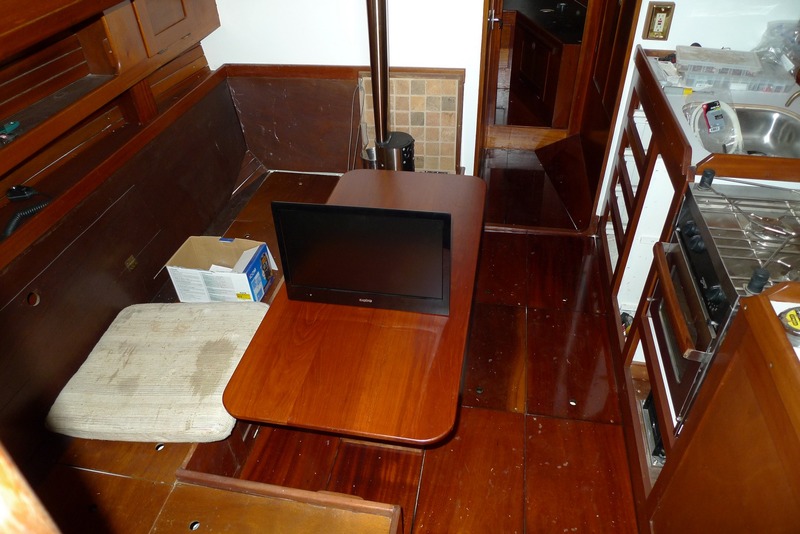 I am reinstalling smaller panels on the starboard and port side of the boat. 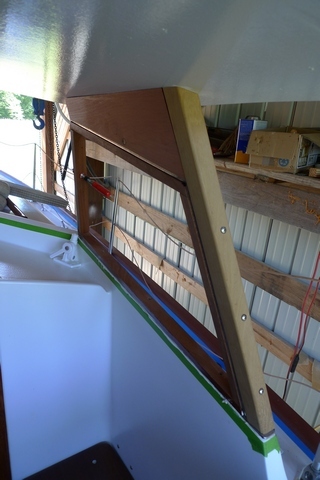 The large panels I had previously mounted were coming apart and I haven't even been on the water yet!! I wish products were built to last. I have remounted new and smaller solar panels today. They are ET Solar 95 watt panels. I glued and riveted and 3/8 inch thick ply panel on the backside to hold everything together better and make a nice strong mount. 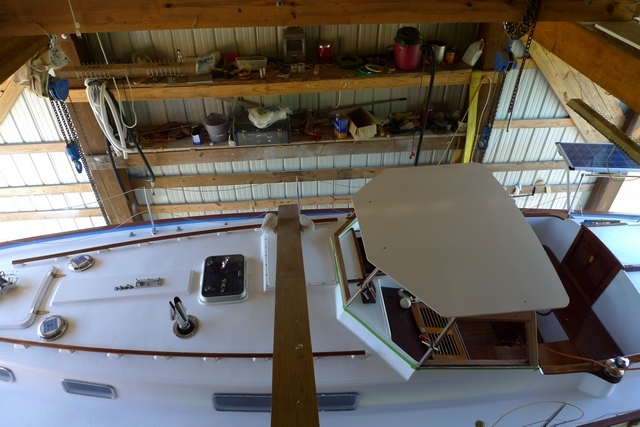 Mounted the foredeck light on mast and I am working on the anchor light. 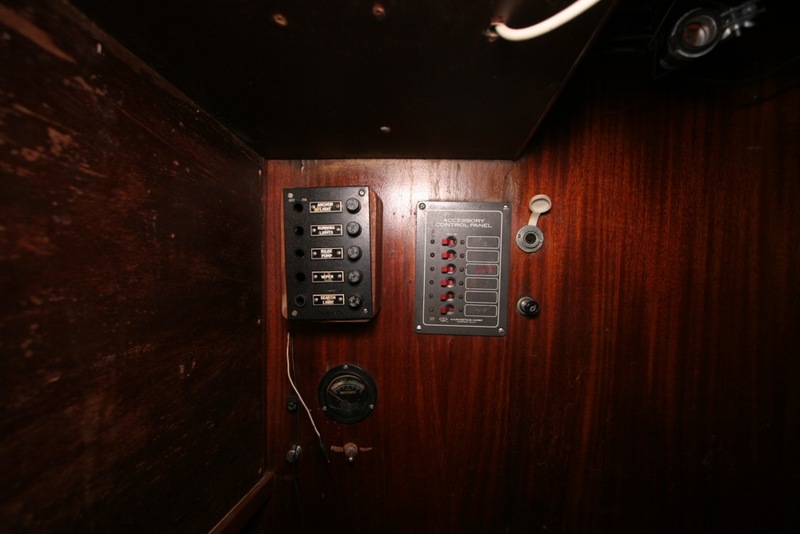 I have lost the plug to the Hella Anchor light model DHJ/08/01/71 and I am currently scouring the internet looking for one. I haven't written much on this web page lately. Most of the jobs I have been doing are not very interesting. Just trying to finish everything up. Like, finish the plumbing like a want it, which meant moving a foot pump I had stuck behind a cabinet door (bad idea) and placing it where the pedal could be reached without opening a door. And adding another foot pump to the head sink. I found out quickley I like to foot pump a lot more than hand pump. I found a leak in the freshwater tank, so I am fixing it. I have been wrestling with the engine install for months now. About to get it the way I want it. 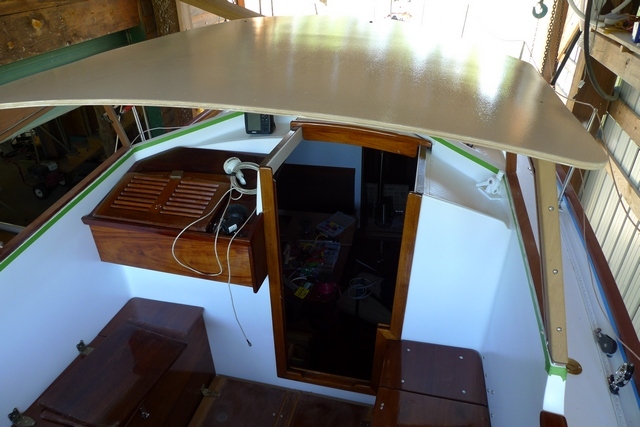 Finished the interior painting and varnishing and had to cover a bit of ceiling with wood. I have written up some of this work in more detail on the HR Rasmus Owners Blog. 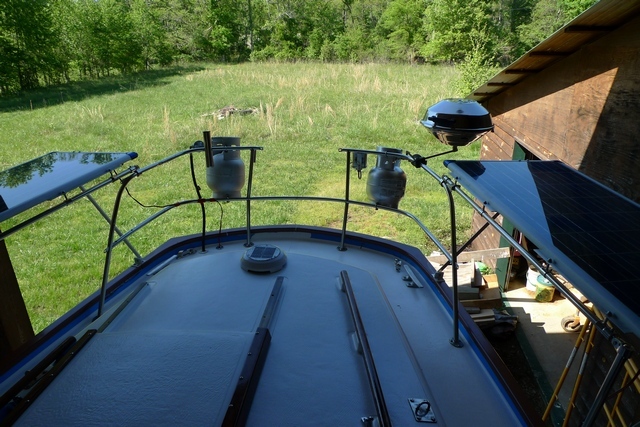 I will end the work portion of this web site in the next couple of months with a flurry of before and after pictures of the boat and a few pics of the HUGE celebration I will have when the boat gets dunked into the Arkansas River. 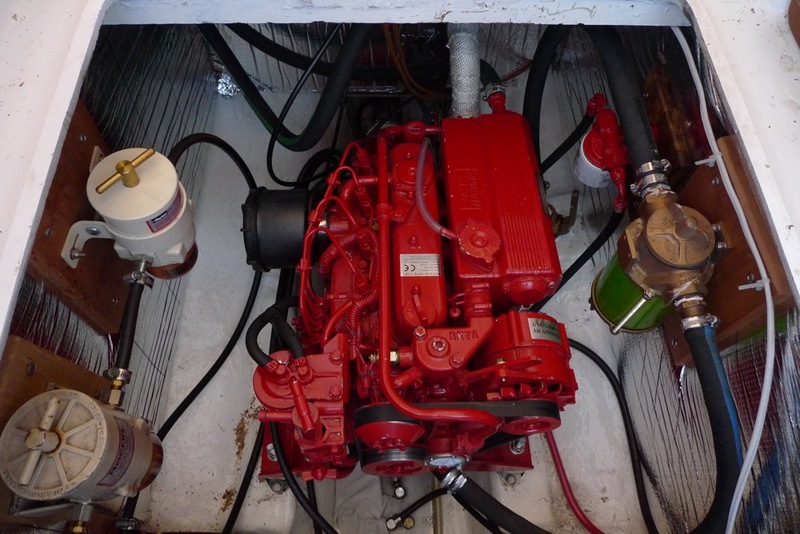 Below is a Series of Post I made concerning my Engine Installation. This is my first Engine installation and I made some mistakes but I have also learned a lot. Thanksfully the mistakes weren't catastrophic. Well I received my new custom engine mounts and they worked great. I have roughly aligned the engine and hooked up the exhaust and electrical. I also hooked up a facet pump (part number 40104) in front of the Racor fuel filter to help lift fuel out of the deep fuel tank. After running it a bit, I blew the 1 amp fuse to the facet pump. I continued to run without the fuel pump. The next day I tried to start the engine (Beta 38) and it would not start. 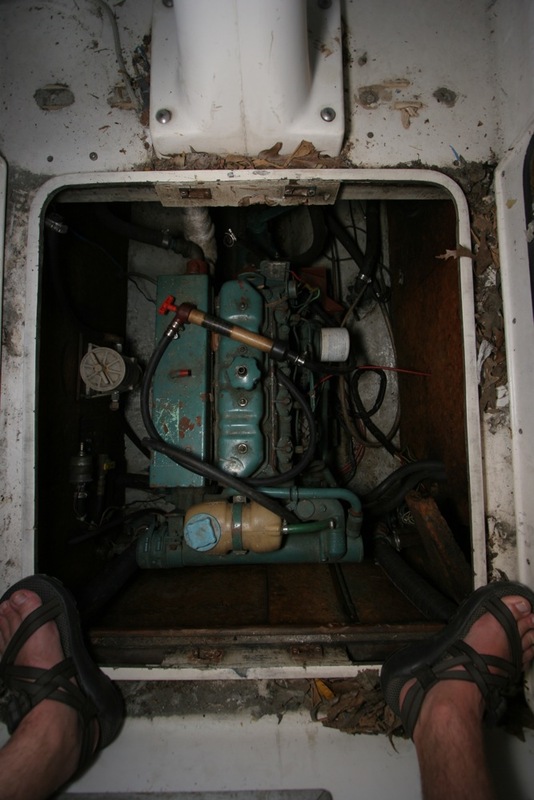 I then realized the facet fuel pump is really needed on this boat/engine combination. I replaced the 1 amp fuse to the pump with a 5 amp fuse and ran the fuel pump a bit before trying to start the engine. No good. I had to re bleed the fuel lines before the engine would start. This was a good lesson to what is needed to get this combination to work well. That facet pump is much needed. Well I have figured out some things with the engine install. And some lesson are learned the hard way. It has been hard to start of late(last two days) and I have been having to re bleed the fuel lines. I thought is was the added Facet fuel pump that blew a fuse that caused the hard starting problems. Nope. I found out what was causing the hard start. I didn't put enough diesel in the tank and it was sucking air. I also found out what can happen when you crank the engine several times without it starting. I got water in the engine!! Today I checked the oil level prior to starting and saw a milky coating on my oil dip stick. I called Beta and they gave me a plan to flush the engine of the bad oil. I pumped out the oil, replaced the bad oil with good, replaced the oil filter, and ran the engine for a couple of minutes. Then repeated the above steps four times. Ended up running 16 quarts of good oil thru it and using up 4 oil filters and it looked like it cleaned up well. I will probably do it a few more times tomorrow just for good measure. 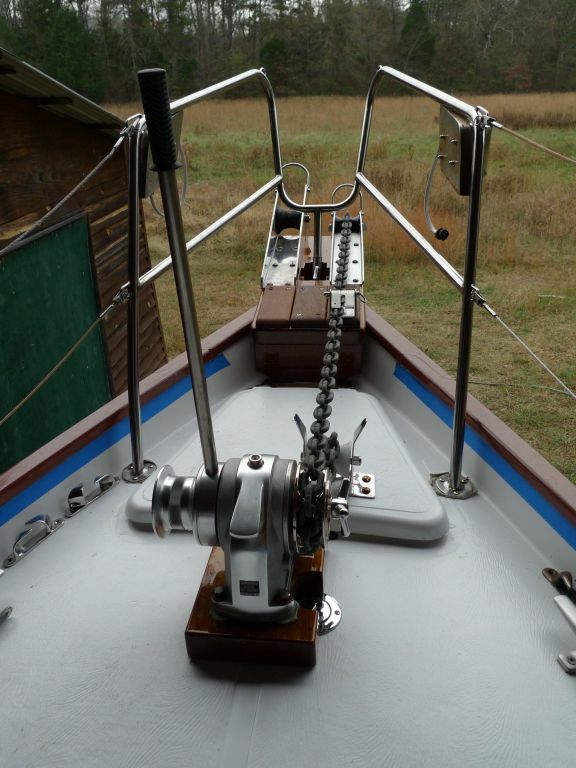 It is running great now that have the fuel tank filled up to an appropriate level and have nice clean oil in the engine. And luckily it was fresh water, so no salt problems should occur. Having hopefully dodged a bullet, I now have to figure out what went wrong. I went to great lengths to get the install done correctly. Hmmm, apparently I missed something. I have a long exhaust hose run and have a Vetus LP60 muffler installed that holds 2.77 gallons of wet exhaust, which I thought would take care this. Maybe not. I am ordering a LSL60 which holds 4.23 gallons of wet exhaust. 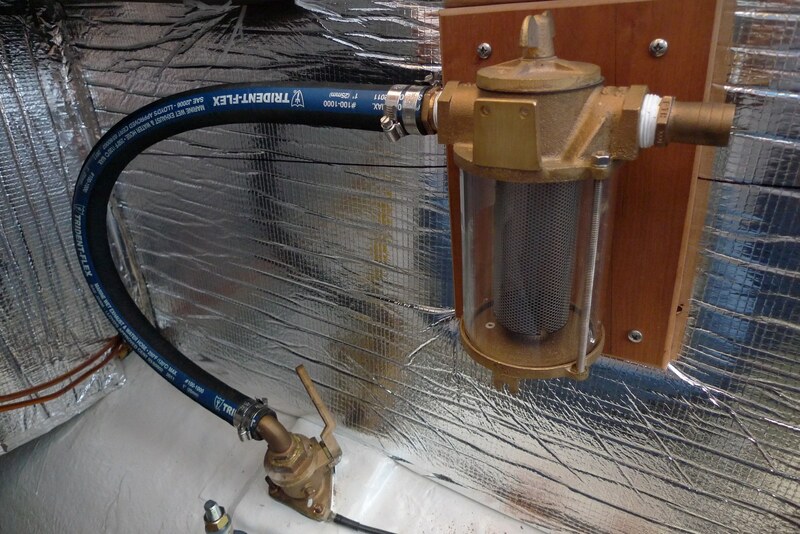 I have a high vacuum loop installed on the water injection hose and a high loop in the exhaust hose itself. That is the way several Rasmus owners I have talked to have theirs set up. The only thing I can think of is that the duration of cranking the engine without a start caused water to accumulate in the muffler to the point of backing up in the engine, not having enough pressure to blow out the wet exhaust. Any thoughts out there would be appreciated. I am thinking that the insufficient fuel level caused the hard start, which caused the back flow of water into the engine, and also saved my engine from destruction when it wouldn't start before I checked the oil level and found the water in the engine. Whew!! 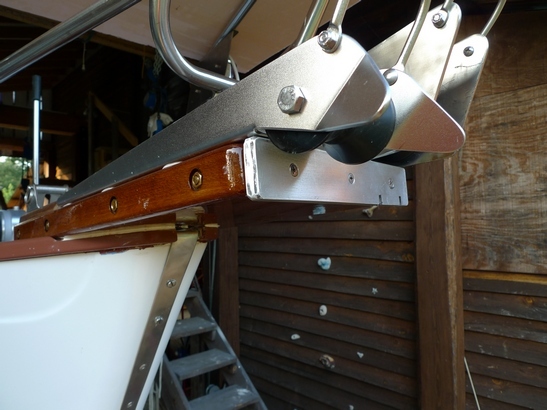 Question: What size exhaust muffler are you Rasmus owners installing in your boat? 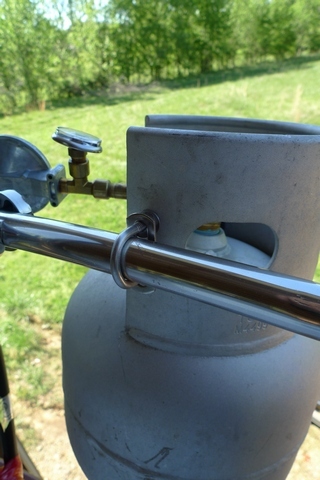 Do you put a loop in the exhaust hose? Also, I want to know how you experienced owners handle hard engine starting situations, specifically, after cranking the engine over an unusually long period of time without a successful start, do you empty out the wet exhaust muffler at some point to keep water from backing up in the engine? Any ideas are appreciated. After getting water in the engine from a back flow of wet exhaust, I found the problem. My exhaust muffler inlet is two inches higher than the high rise exhaust elbow fitting on the engine. I made a big mistake. I relied upon a previous installation as being correct. Since my exhaust elbow is in the starboard locker out of sight from the engine room, it wasn't so easy to spot. That's my excuse anyway! So, as long as the engine starts quickly you don't see a problem. But as soon as a hard starting situation appears, the hose between the exhaust elbow and muffler quickly fills up with water, as the engine doesn't produce the exhaust pressure necessary to push the wet exhaust water up and over to the muffler. The problem is I don't have the space to lower the muffler or enough space to raise the elbow to get the recommended 9 inches of drop from the exhaust elbow to the muffler. Hmmm. I can custom make an extension to my exhaust elbow to raise it above the muffler at a maximum height of maybe 4 inches above the muffler inlet. That puts the top of the exhaust elbow at the very top of my engine room ceiling. But it still doesn't meet the recommended 9 inch drop. What to do. Any suggestions are welcome. Ok, I have redone my exhaust system much like Dave's and Martin's systems. 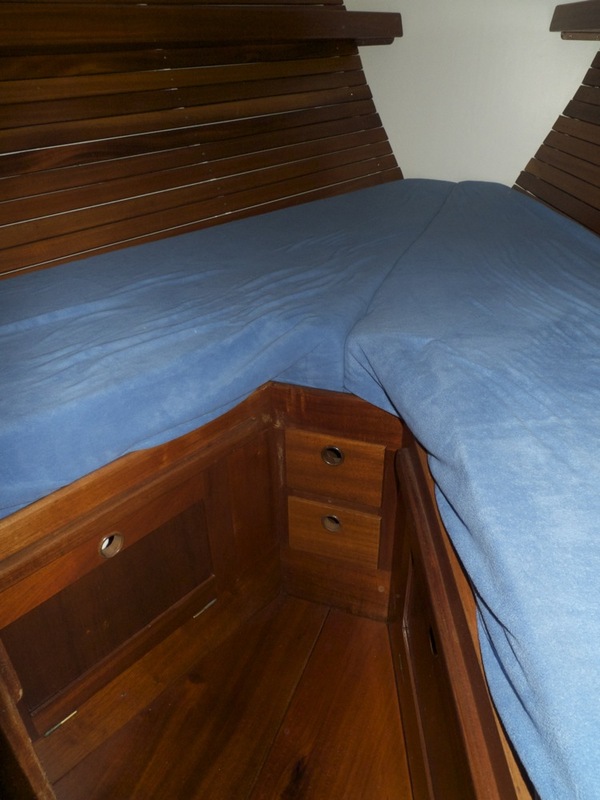 I put the Vetus LSS 50 water lock muffler under the aft cabin closet on a shelf I made just above the prop shaft. That gives me the required drop from the water injection point to the muffler. 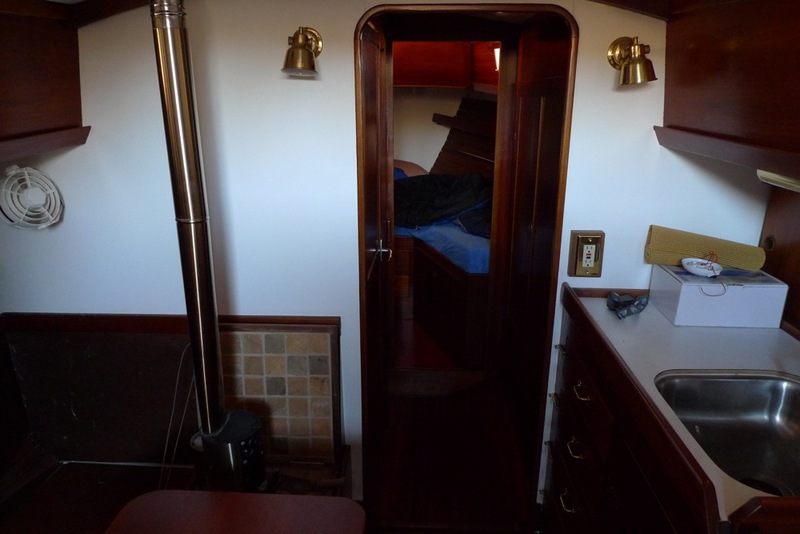 Then ran the pipe straight back to the gooseneck mounted at the transom. 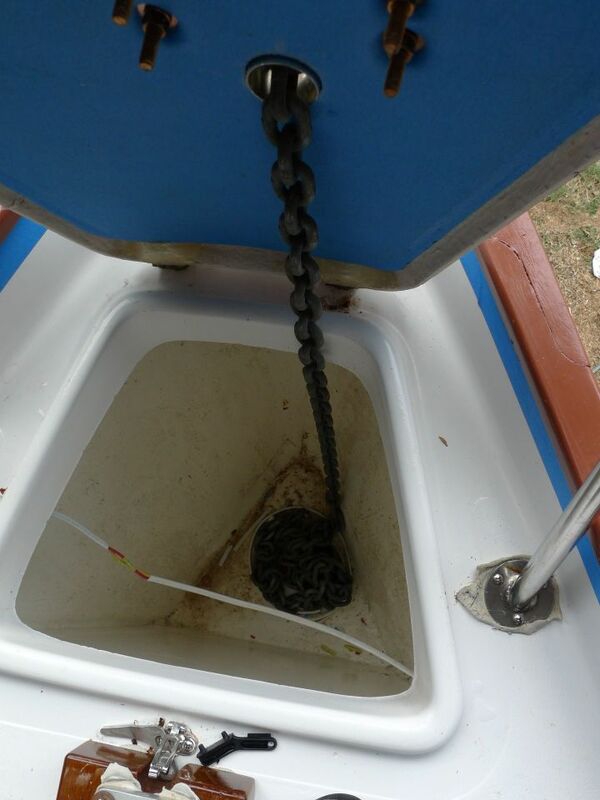 I left the anti siphon loop on the water injection hose high in the starboard locker. That meets the Vetus's installation requirements. So it seems to work fine sitting here in my yard. We shall see when I get into some waves. But, THE BETA ENGINE STILL DIES ON ME!!!!!! It is still getting air in the line somewhere. Its not the fuel level, I checked that. I have at least half a tank of fuel. My Racor fuel filler lid was not screwed on really tight, so I tightened that down really snug. That seemed to help and I thought I had it fixed but after running it for several minutes, shutting it off, then restarting and running for just a few seconds, BAM, the engine dies again. This is driving me CRAZY!!! Any suggestions as to what the problem could be would be greatly appreciated. I will get some pictures posted in a few days of the entire install. I finally found the cause of the dying engine. 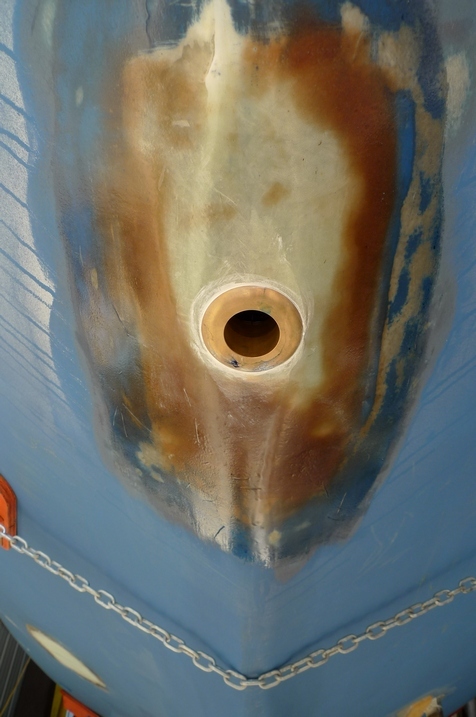 I had an air leak on the fuel lift tube where the nylon tube connects to the aluminum fitting that screws onto the tank. It was a newly replaced part. It's crazy all the sub standard equipment being made. I found it by unhooking the fuel line from the fuel tank (the other end goes into the Facet lift pump) and sticking that end in fresh clean fuel in a bucket and unhooked the fuel line going into the Racor fuel filter and sticking that in the same bucket of fuel (isolating the fuel pump). I turned on my Facet fuel pump and watched for bubbles going up in the bucket of fuel. No bubbles. 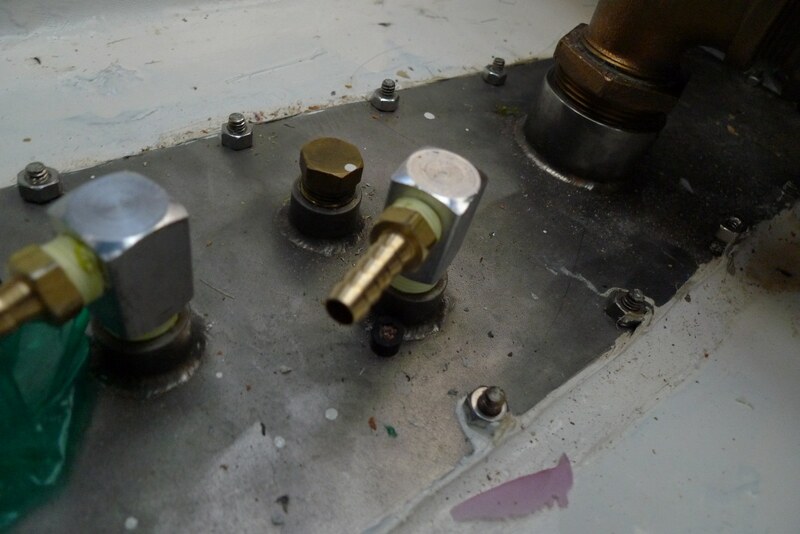 So then I took re attached the fuel hose to the fuel tank and turned on the Facet pump again isolating the tank fitting. I got bubbles coming up in the bucket of fuel. 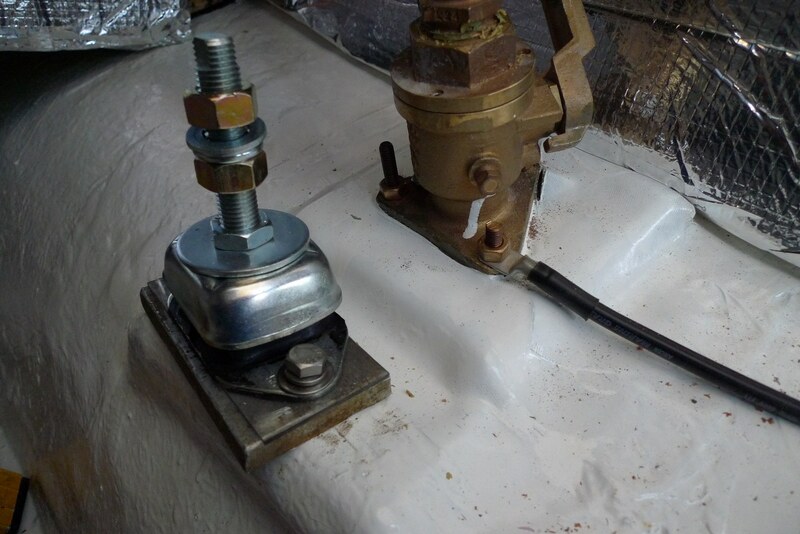 So, the leak has to be at the tank fitting because all of the fuel lines down stream of the Facet pump are pressurized meaning if I have a leak downstream of the Facet pump it will show up as fuel in the bilge, not air in the lines. I changed out the fuel lift tube assembly and the engine ran beautifully. Boy has this little air leaked been frustrating. This is my first engine installation and I knew I would make some mistakes. Thankfully none of them have been catastrophic. They have been very frustrating but I am learning a lot fast and that, in itself, will be worth it in the long haul. I was able to find a marine surveyor here in Little Rock and he was unusually busy at this time of year but was able to squeeze me into his schedule. Insurance companies require a survey before they will offer their coverage. I was dealing with BoatUS Insurance company. Before the survey they were only going to give me coverage up to $25,000. After they accepted the survey, they upped their coverage to $50,000. 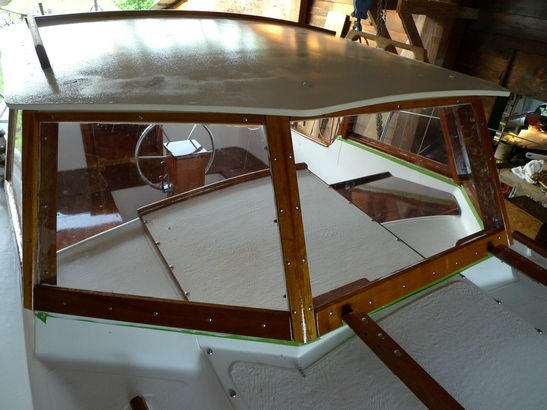 That will cover about half of what I have in the boat if it's totaled but I knew going into this project that this wasn't going to be a money making venture and I would certainly lose money. I will carry coverage insurance for at least a year to gain experience and will later adjust it as I see fit. 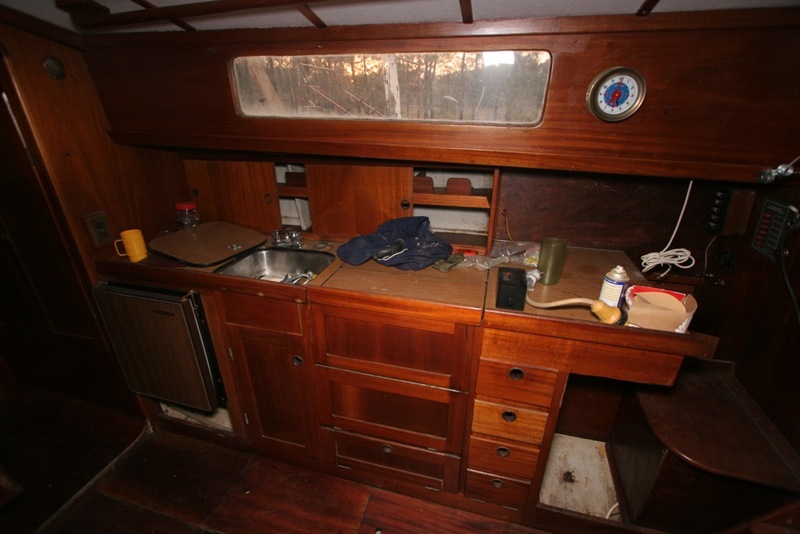 I am scheduled to move the boat the week of Nov. 27th. I only have a 10 mile move from my house to Little Rock Yacht Club. I am cutting it a bit close, but still plan to leave in the middle of January for my trip to the Bahamas. It's getting very exciting indeed. 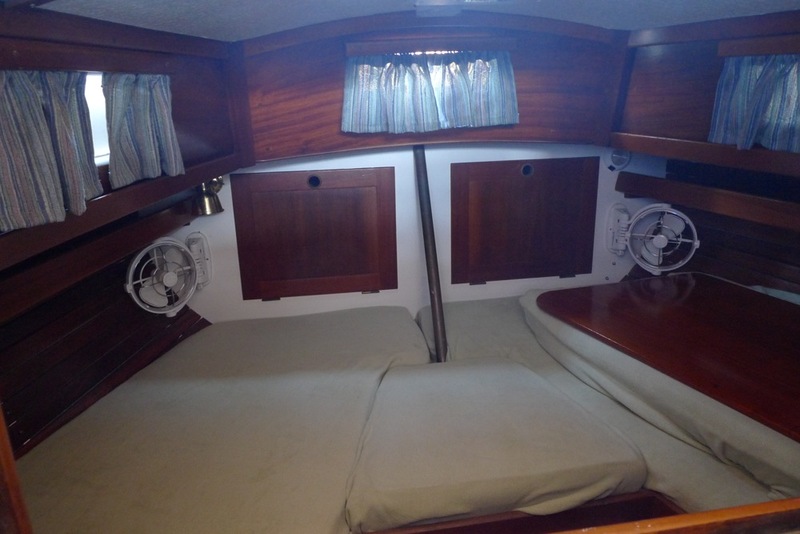 I am going to have to live very frugally during my cruising time. 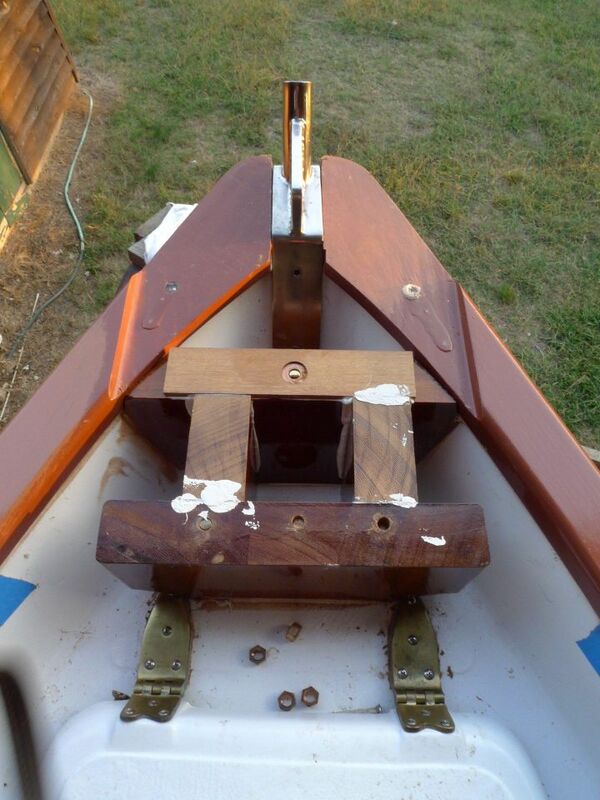 I just hope this boat is solid and will hold up well while I am out there. 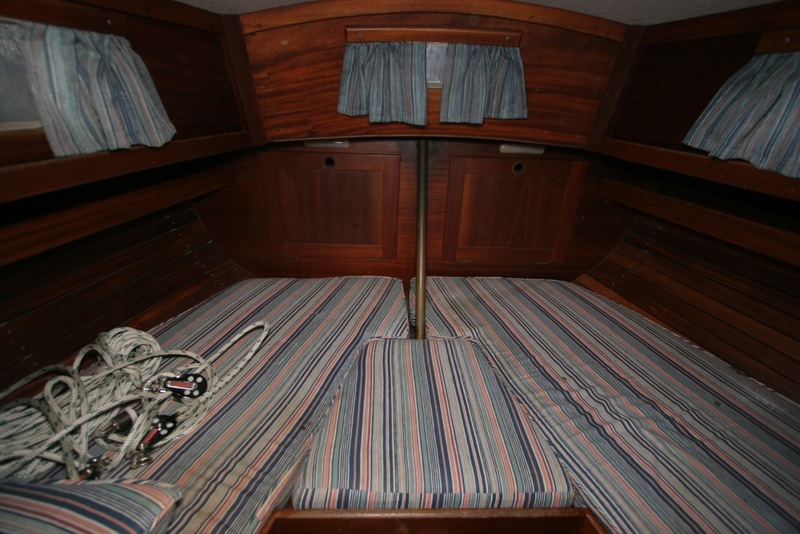 I have more or less completed the Restoration of my Hallberg Rassy Rasmus. It took 5 years. 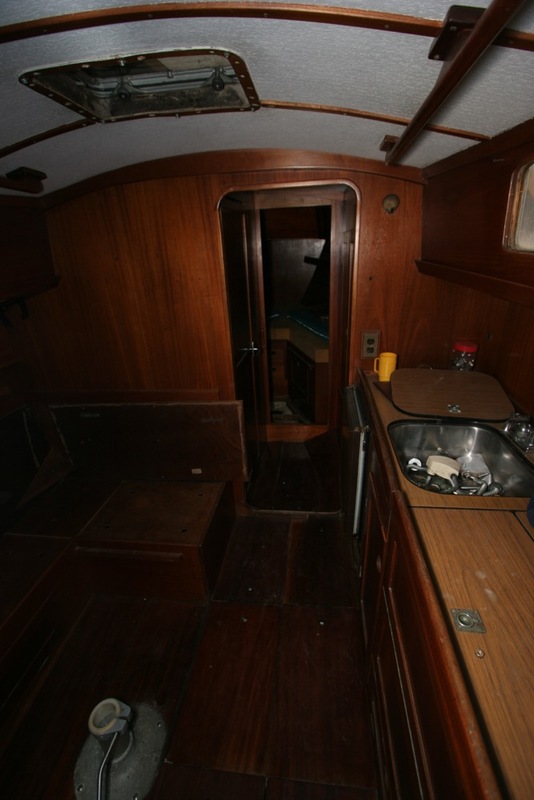 The first two and a half years were part time but the last 2 1/2 I have worked pretty much full time on this boat. It has been a long and hard project and the cost was considerably more than I anticipated. I have enjoyed the work for the most part. It was a challenge and I like challenges. 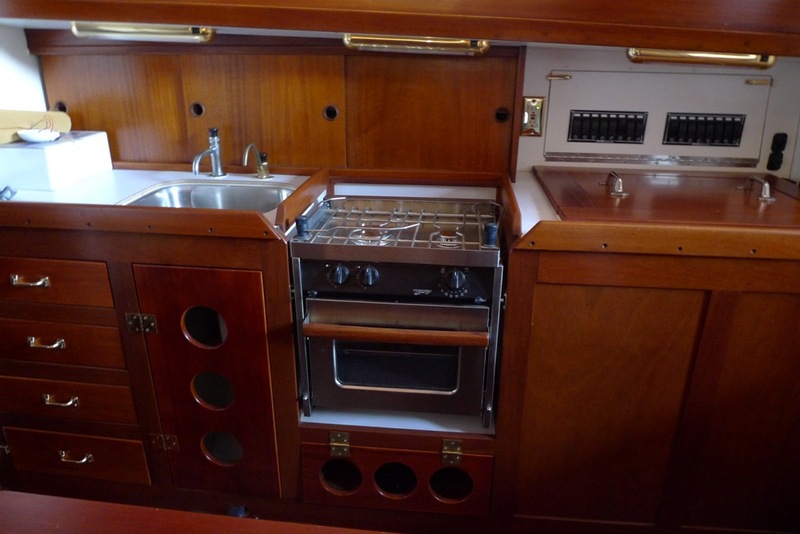 I learned a lot about the boat and it's systems. 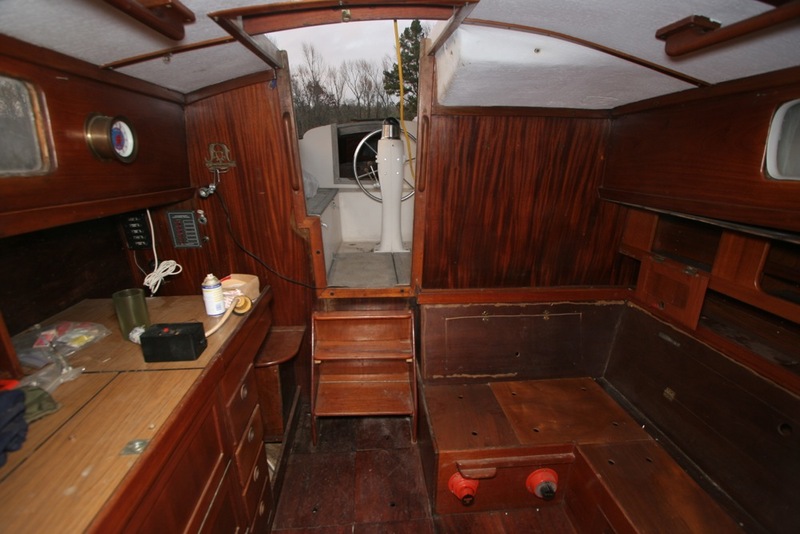 I had no previous experience with boat restoration except for wood working, electrical, plumbing and painting skills I had earned on house building, general construction, and cabinet making. 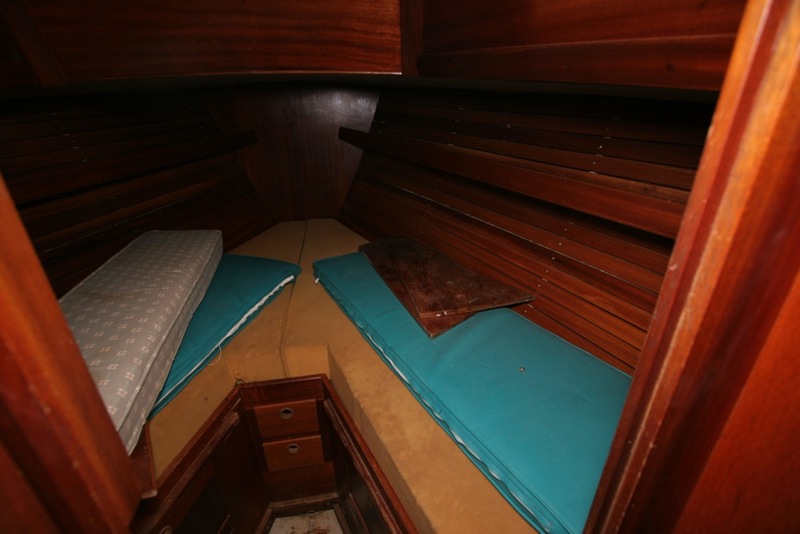 I learned the boat specific skills from books, the internet, and advice from forums and blogs. I turned to Calder's book on boat maintenance and systems often. I do think his book goes into such depth it almost becomes impractical. One of the most satisfying and unexpected aspects has been the communication from other Rasmus owners and boat owners around the world. Without the support from all of those who chimed in I don't know if I would have finished. Thanks. Would I do another project of this magnitude? No. And it would be hard for me to recommend doing a project of this size to an unexperienced person such as myself. The time and financial demands are substantial. Below are before and after pictures of the project. I hope you enjoy looking at them as much as I am going to enjoy posting them. Yeeeehaaaaa! 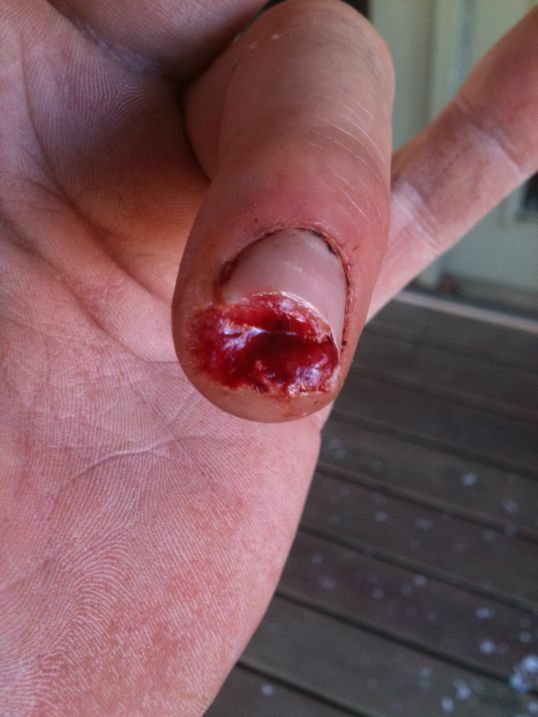 And my finger even grew back. The body is an amazing machine. to get all my screwups over up front. I will pull the boat to check any damage and report. Cheers. 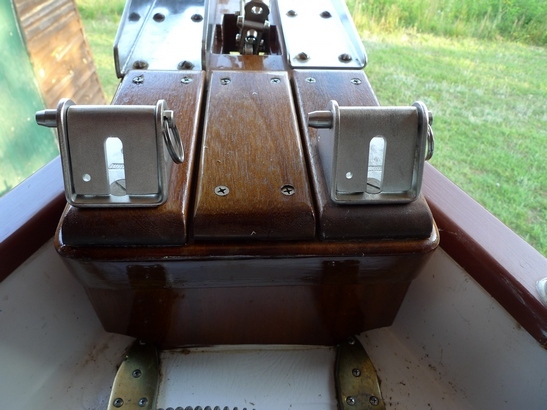 I started out with very little knowledge in boat restoration. What I had was experience in woodworking, painting, plumbing, and electrical from my work in construction. 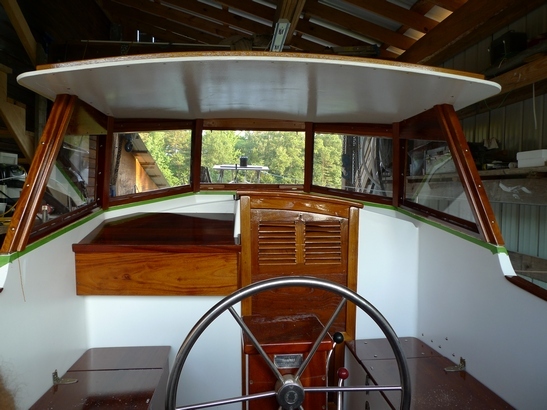 I had also built 4 small wooden boats; three 16 foot McKenzie River drift boats and one Doug Hylan designed 13 foot Maine Peapod. 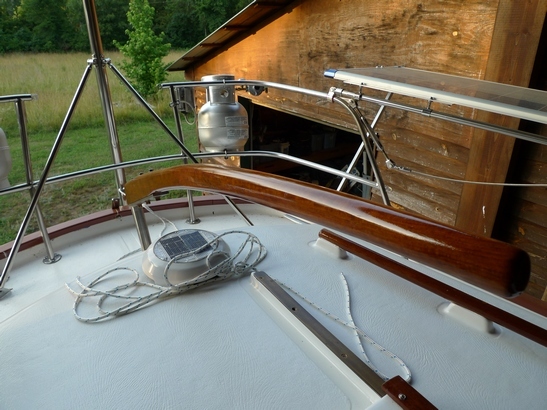 I used three main books for reference during this project, Don Casey's This Old Boat, Nigel Calder's Boatowner's Mechanical and Electrical Manual, and Beth Leonard's The Voyager's Handbook. 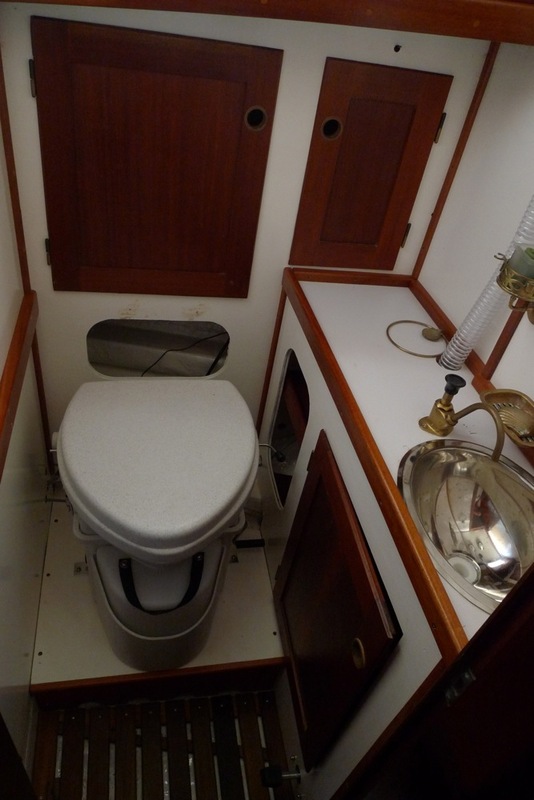 I also talked to boat owners and read blogs on the internet and of course Googled. 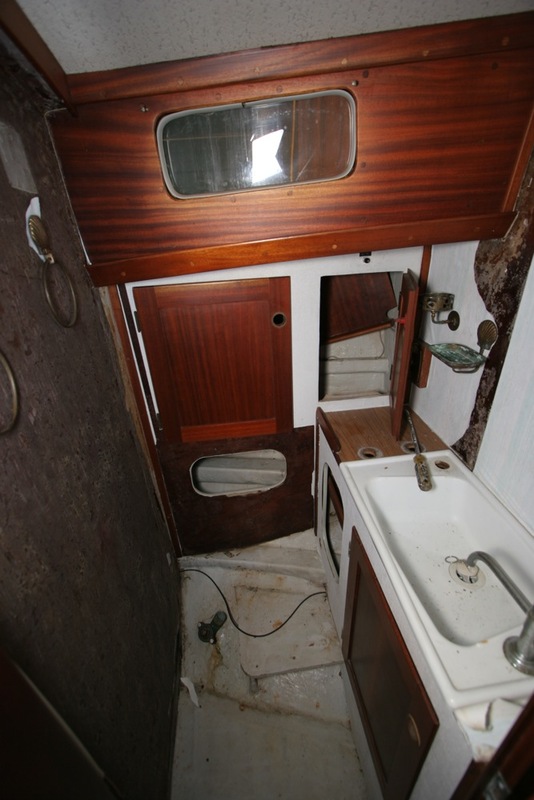 The 1974 Hallberg Rassy Rasmus 35 Hull number 337 was in serious disrepair. It was a wreck. It took me 5 years(2.5 years part time and 2.5 years near full time) to turn it from a wreck to near new condition. The work is documented here: www.lizardheadone.com. 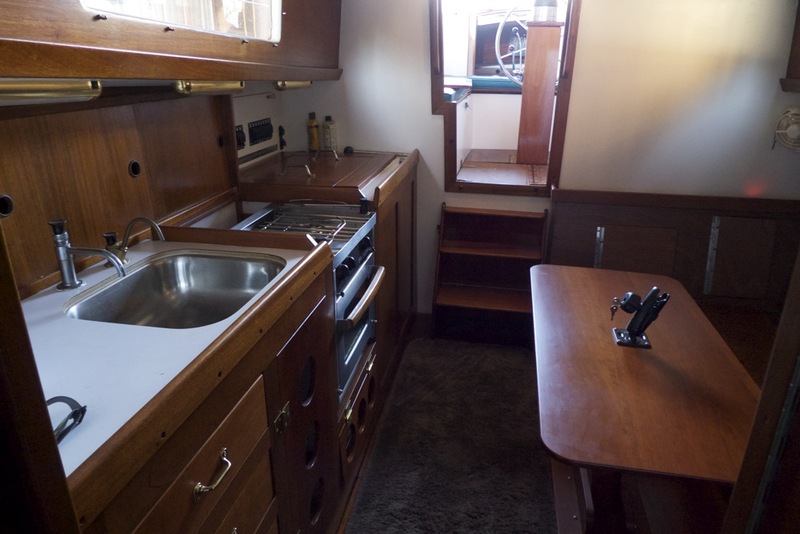 Everything on this boat was replaced except for mast and boom, a few cleats, and the interior cabinetry(I did replace the galley cabinetry). I did 99.999% of the work myself. It took thousands of hours in labor, tens of thousands of dollars, and energy and motivation that at times became hard to come by. This project became a grueling marathon that never ended. But it did. 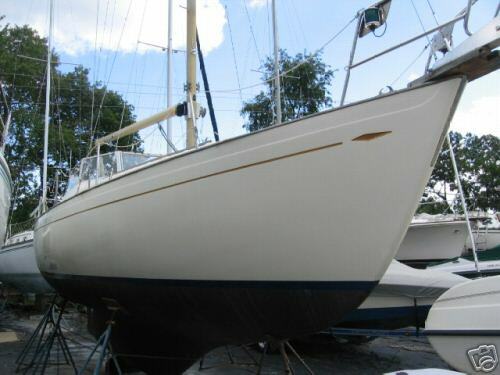 The transformation started almost immediately after stepping the mast. My body released the tension and anxiety that had built up over the last two years of restoration. My legs went weak. It was actually hard to stand for a few hours. A sense of calm and satisfaction was replacing anxiety and stress. The boat restoration had taken it's toll on me. The burden of a job of this magnitude was lifted and it felt good. Now it's time for ME to rehab. In hindsight, I would have taken another coarse in becoming a boat owner. I would have purchased a boat in better condition for starters. One with a nice equipment list. One that would take far less effort to bring back to condition. 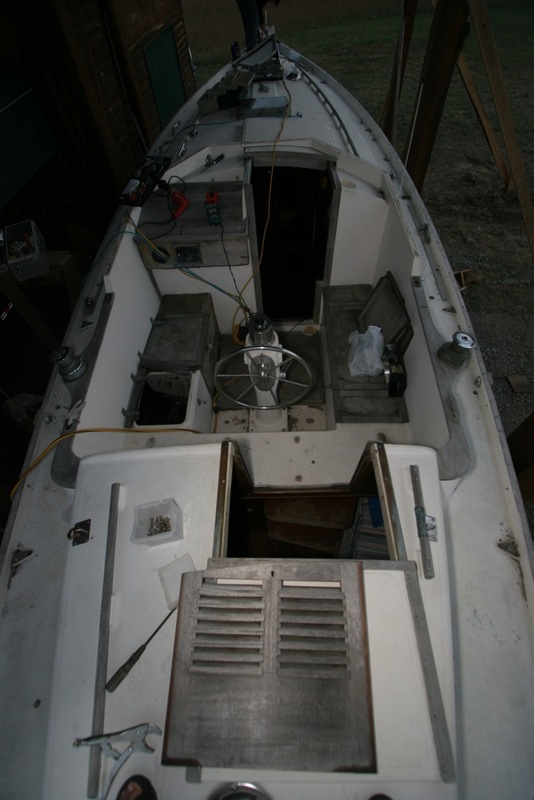 There was no financial advantage to buying a low cost boat and rebuilding it. 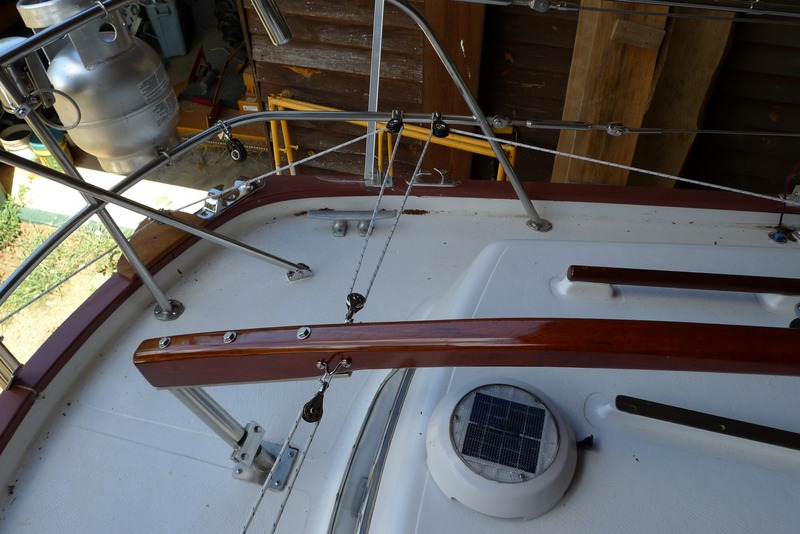 With all the advantages that I had (boat shed at my house, woodworking shop, time, and sufficient funds) the project was almost too much for me. I had doubts many times about finishing. Posting my work on the internet really helped in keeping me motivated. I heard from folks around the world and they gave me encouragement and advice. Thank you. 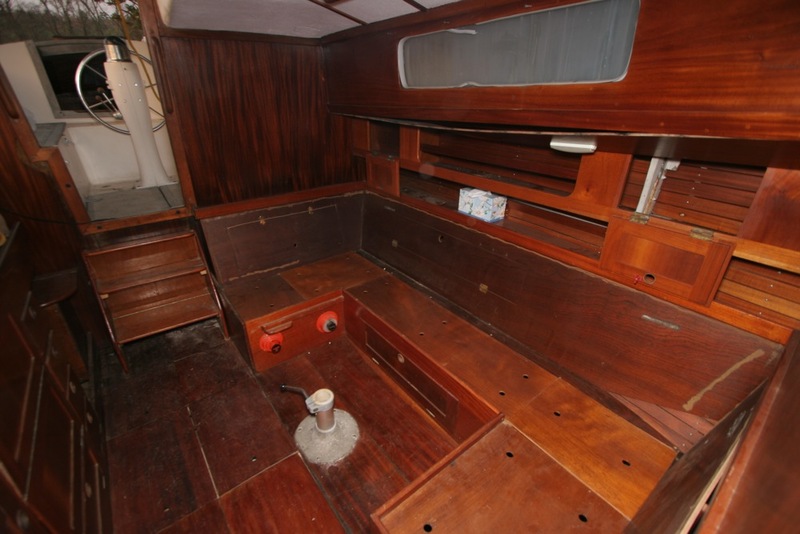 This restoration project did, however, give me a enormous sense of accomplishment. 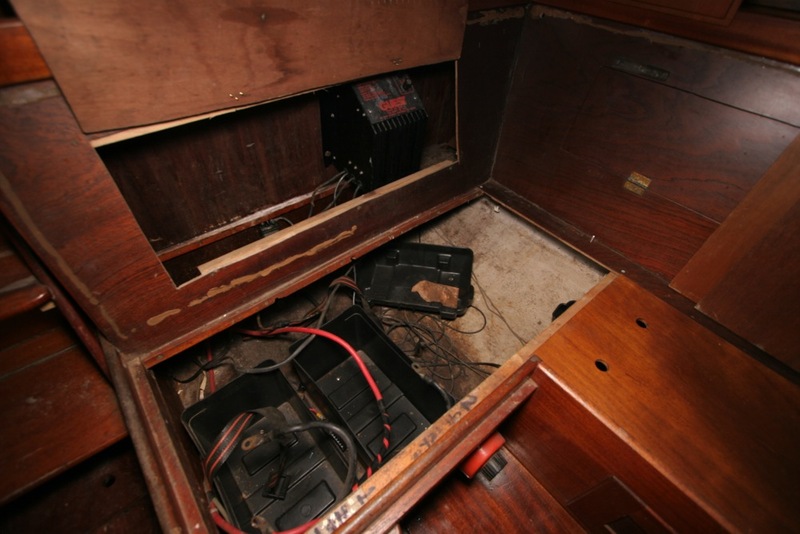 It also gave me knowledge necessary to repair any system on the boat. I really know this boat. This project was a journey in itself, and even though I doubt I would ever attempt something like this again, I believe I will always be glad that I did it. ONCE. All my future posts will be under "Mary Annie Adventure's" page.